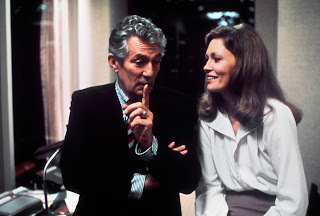 Network vies with Good Night, and Good Luck as my favourite film about television, and about what a rotten business it is. It skewers those who produce the medium and lampoons those who consume it. 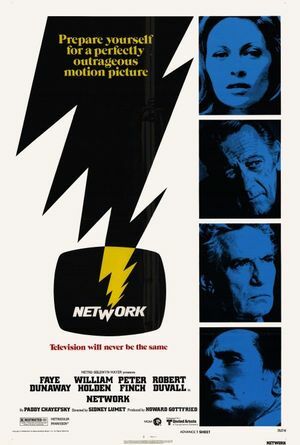 Its critical, commercial, and award-ceremony success demonstrated a deep contemporary vein of discontent about infotainment and neutralized news, and it predicted the coming of car-crash programming when Jerry Springer was still a crooked and nymphomanical city councillor. It features Peter Finch's last performance, William Holden's last great performance, and Faye Dunaway at the height of her seductive dishevelment. It's an easy film to criticize, but as Gene Siskel once stated, it invites criticism only at the highest level. The second half is preachy, but only because the screenwriter feels a rightful and righteous anger about television's depravity. The tone varies between drama and farce, but this is quite deliberate, and some of the farce is hilarious (as when a group of radical leftists negotiate with studio executives over percentages and distribution rights). The romance between Holden and Dunaway is unconvincing only because the performances are otherwise authentic. The Dunaway with the schoolgirl crush is inconsistent with a sassy woman full of scatty and manic ambition. Holden's older man in search of an Autumn romance conflicts with his intelligence and idealism. New York, alternately rainy and windy, enabling the characters to don the heavy coats that look so good in that city, provides both a skyscrapered backdrop for the office scenes and brownstoned down-at-heelness for the goggle-eyed mobs. It also provides its great Public Library for a number of interior scenes, its grandeur suiting the lofty and nebulous ambitions of the snake-oil salesman who runs the eponymous network's holding company.